Yesterday morning marked a baking frenzy, making Christmas biscuits for the children to decorate. The whole house ended up smelling of gingerbread,which felt very festive. I use a tried-and-tested recipe that has been part of our Christmas for several years now, and also comes in handy for children’s parties and playdates. The children particularly like rolling the biscuits out, cutting out the shapes and decorating them with lavish quantities of icing sugar and sprinkles. Provided you chill the dough before rolling it out, the biscuits come out of the oven still in the shapes you cut out, rather than melting and spreading into one big disappointing mess. Result! 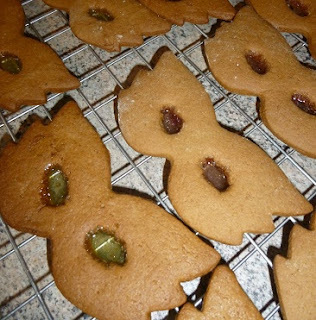 So here’s my recommended recipe, followed by top tips for making Christmas biscuits. For the icing, I use about 100g icing sugar, sieved, with a few tablespoons of water mixed in, plus any food colouring. Preheat the oven to 190 degrees normal oven / 180 degrees fan over / Gas Mark 5. Prepare the baking trays by either greasing them with butter or marge, or lining them with greaseproof paper. Put the flour, bicarbonate of soda and ginger into a bowl. Rub in the stork or butter, till it’s bit like fine breadcrumbs. Alternatively, bung into a food processor, press the button, and prepare yourself to face the washing up afterwards. Next add the sugar, syrup and egg and mix together to form a dough. Put the dough in a plastic bag and chill in the fridge for a good 15 minutes. Knead the dough a bit, then roll out on a floured surface and cut out whatever shapes you want. Put the biscuits on the trays, with space between them in case they do spread a bit in the oven. Bake in the oven for 10 minutes or so, until golden brown. Might take a few more minutes. Remove the trays, leave to firm up for a few minutes, then transfer to a wire cooling rack. When they’ve cooled right down, scoff the lot, or go crazy with icing and sprinkles. I priced these up at Morrisons, because it’s usually good value and my nearest supermarket. Total: £1.15, plus icing sugar and sprinkles if desired. Seriously, you can use Stork. No-one will know it’s not butter, and it’s a lot cheaper. If you still want to use butter, make sure it’s room temperature before you start, rather than a frozen lump straight out of the fridge. Check out the world food aisles in the supermarket for ground ginger – you’re likely to get a bigger bag for a lot less than if you buy a fancy branded jar from the herbs and spices section. The recipe makes a reasonable amount of dough, so sometimes I’ll use half and freeze the other half for another day. Once you’ve made the dough, shove it in the fridge for at least half an hour, or even all day or overnight. Crucially this means the biscuits are less likely to spread out into unrecognisable shapes during cooking. When you take the dough out of the fridge, you’ll need to squeeze it between your hands a bit so it’s soft enough to roll out, but otherwise it should be fine. Otherwise, you could cut the biscuits out first, put them on trays, and then put the trays in the fridge to chill. However this does depend on a) having a big enough fridge and b) having enough room in said fridge to cram in baking trays of biscuits without disaster. Resign yourself to some kitchen chaos when cooking with children. Accept that you (and they) will need to fling some flour around on the surface where you’ll be rolling out cookies. Otherwise the biscuits will stick, and you’ll be left prising distorted shapes off the table or worktop. Remember to sprinkle flour on the rolling pin too. I’ve tried these biscuits rolled out thin, when they have a delightful crunch, and distinctly thicker, when they end up more chewy in the middle. Go wild and try out different thicknesses to find out what you prefer. The thinner you roll it, the more biscuits you’ll get out of the same amount of dough. 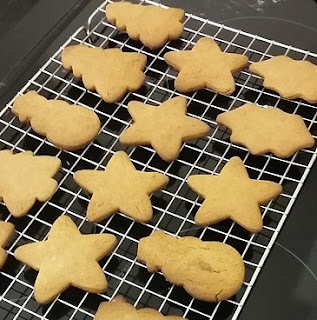 Voice of bitter experience: however over-excited your children might be about decorating biscuits, don’t attempt it straight out of the oven. The icing melts, the sprinkles melt, and it all ends up a big melted mess. Leave them on the tray for a few minutes, and transfer to a wire cooling rack for 10 minutes or so – it needn’t be too long. These biscuits also store well for several days, uniced, in a decent airtight box, so can be baked ahead. Fewer things are more disappointing than a tray of beautiful biscuits, which shatter when you try to remove them, because they are stuck like concrete to the baking tray. Fact. It’s worth preparing the trays, either by greasing them with lavish amounts of butter or marge, or by lining them with greaseproof paper. I just mix up icing sugar, water and food colouring to make icing for biscuits – easy and cheap. 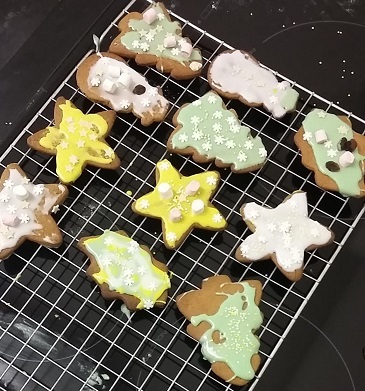 If you want to do white icing as snow on Christmas biscuits, you don’t even need the food colouring. However, do be careful when adding water. I seive the icing sugar into a bowl and then add the water a spoonful at a time, mixing in between. You can always add a bit more water, but if you slosh in too much the icing can get way too runny, and then need loads more icing sugar added to make it usable. Some sprinkles cost an arm and a leg if you’re buying multiple packs, but Poundland is a good source for less. 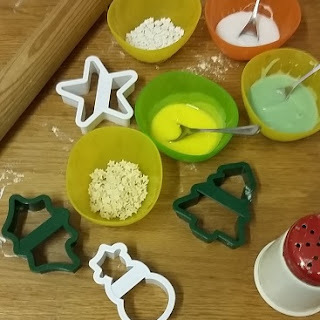 The Jane Asher range includes 2 for £1, and also does pairs of food colour gel tubes for £1.We used white chocolate stars and sugar snowflakes for our Christmas biscuits. Most sprinkles are pretty much pure sugar, so will keep for ages. I’ve had limited success with little tubes of writing icing, because I find it really hard to squeeze the icing out. Get creative, depending on what you’ve got in the house. Yesterday we raided the raisins and the mini marshmallows bought for hot chocolate. See the strip across the cutters? Makes it easier for kids to press down. Years ago, I bought a set of four plastic Christmas cutters from Lakeland. They are hardly glamorous compared to traditional metal cutters, but have the advantage of a handle across the top. This is particularly good with toddlers and young kids, because then they use them the right way round, and don’t hurt their hands pressing down on a sharp cutting edge. If you get shanghaied into baking for Christmas fairs, this is a good basic recipe. 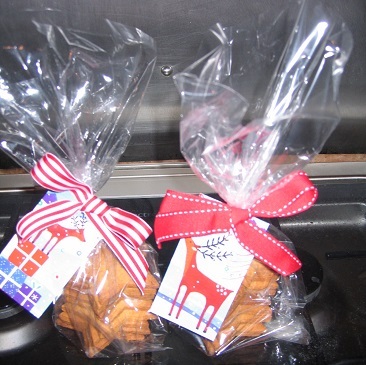 In the past, I’ve bagged up star shaped cookies, added some ribbon at the top, and they’ve sold well on the cake stall. I’ve also given them out as token Christmas presents, complete with labels cut out from last year’s Christmas cards, with the ribbon threaded through a hole made with a hole punch. In the past, I’ve bought big packs of cellophane bags – 50 or so – and used them for party bags or sweet cones as well as biscuits. These biscuits are too good to keep just for Christmas! I’ve baked loads for children to decorate at parties or when people come to play. I use different cutters depending on the theme – dinosaurs, superhero masks, pirate parrots, circles as Minion faces and even dress and pyjama trousers for a sleepover party. Make up bowls with three or so different colours of icing, set out loads of sprinkles, provide more spoons than you ever thought possible and then stand well back. Oh, and if you’re doing it at a party – give everyone a paper plate to go underneath their biscuit while decorating. If anyone wants to take theirs home rather than eating it immeadiately, get them to write their name on the plate. Helps match abandoned biscuits to proud producers come home time. 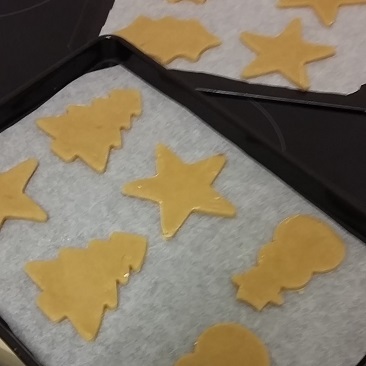 Ever made Christmas biscuits? Any top tips or favourite recipes to add? I’d love to hear! Agree about Stork being perfectly good for baking, even if some people get sniffy about it and bang on about the importance of 'proper butter'. Will definitely have a go at making these biscuits. I do find that homemade pressies go down well, especially biscuits and brownies/tiffin. I save cellophane wrapping from other packaging, and use it to wrap foodie gifts, along with a little ribbon. Might not be Bake Off quality, but seems to always get eaten.